The iVA series Cable and Antenna Analyzer enables users to accurately measure and locate VSWR/return loss faults in their RF infrastructure. 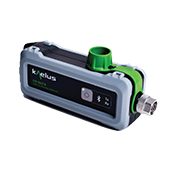 Its wireless connectivity allows unprecedented measurement flexibility and potential in sweep and multi-port testing. The iVA is a rugged battery-operated module that can be remotely controlled with any Bluetooth-enabled device or any of our iPA series Portable Passive Intermodulation analyzers.